Would you take the bait? Dropped into the middle of St Petersburg, handed a lottery ticket worth millions––life-changing money––would you run? Yet they are watching. They are waiting. These oligarchs won't make it easy––unless it profits them to let you claim the prize. With eyes on a much bigger prize––Presidential elections are not too far away––these men will stop at nothing. Welcome to the world of the Hunt. From the internationally read and chart-topping author of The Tablet, comes his most jaw-dropping series yet. “Exciting, thrilling and totally unputdownable! ★★★★★ Gripping from the get-go! Gripping from the get go! A similar world to ‘The Tablet' also by Tim Heath, which I loved too. Fantastic and clever story line. 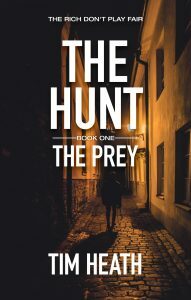 I'm looking forward to the next book in this The Hunt series. ★★★★★ With one word: A*M*A*Z*I*N*G ! WOW! What a rush! This book is absolutely perfect; I can’t wait for the whole series of “The Hunt”. The first Book “The Prey” is so good! From the first pages you can’t let it down, when you start thinking that everything goes smoothly you have a twist and you get shocked! And then you have to read more! I really appreciate when I can’t imagine what’s going to be next; I love a good story with unexpected twists! A well written book with action, thriller, twists, excitement, agony… With one word: A*M*A*Z*I*N*G ! This is a real page turner. Tim has come up with a highly original idea which could be quite plausible. Russian oligarchs probably would be able to play games like this and how easy would it be to escape their clutches? Like Tim's other books, there are surprises and unexpected twists to the plot. I can't wait to read the next book in the series. An enthralling book featuring a novel concept and showing what can happen when it's taken to extremes for the pleasure of the jaded super-rich. ★★★★★ Could not put it down!!! I am totally in awe of this author. Tim Heath takes the most out there ideas and runs with it, making them plausible, fascinating and engrossing. The Prey is the first of a series and if this first novel is anything to go by then it's going to be mind blowing! I encourage everyone who likes their books full of suspense and thrills to read this, you won't be sorry – and will be impatiently waiting for the next in the series. ★★★★★ He did it again! No spoilers! As I do not approve of spoilers, I suggest you read the blurb above for a summary of what Heath has in mind for you to know before beginning your reading of his book. There are a few things I can share with you, though, that will not spoil the experience for you.This book reads smoothly with a good flow and is formatted in a way that enhances reading. Put simply, it is well-organized, has a minimum of errors, I think I found “a” misspelling, and it is a clean book considering some of the characters involved. I imagined this book as a movie as I read; Heath has a way of describing every element in his books, but does not weigh the reader down with superfluous words. This book has a large cast of people within it, but I found it easy to keep everyone straight without “brain strain”. When holding conversations, the people are recognizable and their word usage fits their profile. You are so rich that you can do anything except – well, now: avoid being bored, live forever, things like that. So you get together with others in your rarefied range, and set up a nasty little game to play together to get your blood running, or spilling. This book is the bloody result. I enjoyed it, in a hold-your-breath, ouch! kind of way, and I really want to know what happens next. It is that kind of book. You will enjoy it, unless you are one of the not-rich people in the story, but that's life, isn't it? Very good reading, draws you in real quick. The characters are very believable, the plot has you hanging on. Can't wait to read the 2ND BOOK.definitely recommend to anyone who likes a fast-paced novel.